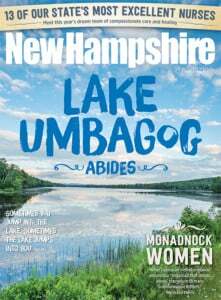 The loons are back again on Squam Lake and echoes of the 1981 film “On Golden Pond” still remain in the towns of Ashland and Holderness where it was filmed. Today, while some people still come in search of the biggest fish in the lake (Walter), others cast their line for great retail finds and they catch them. Golden Pond Market and Country Store is where people in the area catch up with one another while picking up a few groceries and town news. The Squam Lake tees and sweats, caps and other fun items are reasonably priced, colorful and full of fun. The wooden oar paddles engraved with the map of the lake are spectacular ($69). Look for locally made food items, produce and specialty-cut prime meats. Spruce up your camp this spring with a few new toss pillows from the Red Barn Shop. This rambling old barn is owned by the couple that owns the Squam Lake Inn, which is next door. Look for lake-themed gifts, wall art, candles, Dash & Albert rugs, pottery and hostess items. The barn offers a sweet and sophisticated selection of baby items. The hours vary so it’s best to call ahead. This same enterprising couple also runs the Squam Lake MarketPlace, where you can grab a few grocery items, specialty foods, great cheese, beer and wine, and anything your heart desires for the perfect picnic. You’ll salivate over the killer sandwiches. But save room — this place is known for their homemade ice cream sandwiches. T-shirt from Golden Pond Country Store. Squam Lakes Artisans is a gallery full of the works of artists from around the area and it is not to be missed. Stroll through this rambling old home and discover how the area influences art. Look for woodcarving, pottery, paintings in different mediums, jewelry, ceramics and more including tiles, fiber and baskets. Be sure to ask questions; these enthusiastic artists love to explain their work. So you need a new screen door? Don’t head to a big-box store; instead, check out the Habitat for Humanity ReStore. You’ll find old doors with character, bathroom fixtures, molding, tools, lighting, windows, old counter tops, furniture and more, all for ridiculously low prices. The items here are all donated to the cause of Habitat for Humanity and what isn’t used to build affordable housing is put back in to the mix to sell. This is a win-win for all. Vintage Fret Shop is an educational experience in all things strings. You’ll find vintage violins, fiddles, guitars, mandolins, banjos and more, all beautifully displayed and artfully restored or new. The shop, in an old house, has amplifiers, speakers, harmonicas (from $6 to $260) and anything that makes a pleasant noise. As you enter the shop, the door “strums” from a guitar affixed to the ceiling! Check out the Taylor Liberty Tree Guitar; it is the last guitar made from the last standing Liberty tree (historic Boston Elms during the Stamp Act). Bring a wad of cash — it sells for $10,000. Scrumptious and alive with color describes Mountain Laurel Flower Shop, where you’ll find artful flower arrangements, cut flowers, plants, terraria, succulents, lovely gifts, note cards and a whole lot of inspiration. With Mother’s Day around the corner and wedding season coming up, this store is bustling. Ashland Antiques is an antique store on caffeine. This shop is packed to the gills with items that are hard to find and somewhat in the niche category. Look for Barclay lead soldiers and original World War I items, from uniforms to pouches and blankets. The owner likes to say her shop is a “man-tique” store, which means guys looking to dress up their man caves find shopping here a blast. Sizzle this spring and summer in an outfit from Wholly Tara, a fabulous boutique with a huge following. From casual to dress, this shop will wow you. Discover flattering jeans from AG Jeans, J Brand, Not Your Daughter’s Jeans and more. Be sure to walk to the back room, where you’ll find fabulous markdowns. My apologies in advance if you put on a pound or two, which is likely to happen once you set your eyes on the fudge counter at The Common Man Store. Think you’ve tried them all? Check out salted caramel nut roll, Baileys, Snickers, mint chocolate, birthday cake and pumpkin nut. This two-story shop is filled with fun items including cookware, baking items, cold wine, bar essentials, pancake mix from Polly’s Pancake and “really” aged cheddar cheese from Harman’s.